↑ Wheatley, Mark & Annika Pabsch (2012). Sign Language Legislation in the European Union - Edition II. European Union of the Deaf. ↑ John Bulwer's "Chirologia: or the natural language of the hand. 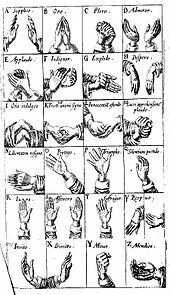 ", published in 1644, London, mentions that alphabets are in use by deaf people, although Bulwer presents a different system which is focused on public speaking. ↑ Bulwer, J. (1648) Philocopus, or the Deaf and Dumbe Mans Friend, London: Humphrey and Moseley. ↑ Dalgarno, George. Didascalocophus, or, The deaf and dumb mans tutor. Oxford: Halton, 1680. ↑ See Wilkins (1641) above. Wilkins was aware that the systems he describes are old, and refers to Bede's account of Roman and Greek finger alphabets. 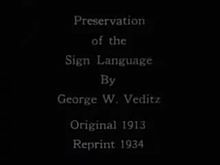 ↑ Montgomery, G. "The Ancient Origins of Sign Handshapes" Sign Language Studies 2(3) (2002): 322-334. ↑ Moser H.M., O'Neill J.J., Oyer H.J., Wolfe S.M., Abernathy E.A., and Schowe, B.M. "Historical Aspects of Manual Communication" Journal of Speech and Hearing Disorders 25 (1960) 145-151. ↑ Daniel Defoe (1720). "The Life and Adventures of Mr. Duncan Campbell"
↑ Lucas, Ceil, Robert Bayley and Clayton Valli. 2001. Sociolinguistic Variation in American Sign Language. Washington, DC: Gallaudet University Press. ↑ Lucas, Ceil, Bayley, Robert, Clayton Valli. 2003. What's Your Sign for PIZZA? An Introduction to Variation in American Sign Language. Washington, DC: Gallaudet University Press. ↑ Cf. Supalla, Ted & Rebecca Webb (1995). "The grammar of international sign: A new look at pidgin languages." In: Emmorey, Karen & Judy Reilly (eds). Language, gesture, and space. (International Conference on Theoretical Issues in Sign Language Research) Hillsdale, N.J.: Erlbaum, pp. 333–352; McKee R. & J. Napier J. (2002). "Interpreting in International Sign Pidgin: an analysis." Journal of Sign Language Linguistics 5(1). ↑ Rubino, F., Hayhurst, A., and Guejlman, J. (1975). Gestuno. International sign language of the deaf. Carlisle: British Deaf Association. ↑ McKee R., Napier J. (2002) "Interpreting in International Sign Pidgin: an analysis." Journal of Sign Language Linguistics 5(1). ↑ Klima, Edward S.; & Bellugi, Ursula. (1979). The signs of language. Cambridge, Massachusetts: Harvard University Press. 0-674-80795-2. ↑ Fabian Bross (2016). “Chereme” Archived 2018-03-17 at the Wayback Machine.. In: Hall, T. A. Pompino-Marschall, B. (ed. ): Dictionaries of Linguistics and Communication Science. Volume: Phonetics and Phonology. Berlin, New York: Mouton de Gruyter. ↑ Emmorey, K. (2002). Language, cognition and the brain: Insights from sign language research. Mahwah, NJ: Lawrence Erlbaum Associates. ↑ p. 970-972. Linguistic Bibliography for the Year 1988. Leiden, Netherlands:Brill. ↑ Battison, Robbin (1978). Lexical Borrowing in American Sign Language. Silver Spring, MD: Linstok Press. ↑ Liddell, Scott K. (2003). Grammar, Gesture, and Meaning in American Sign Language. Cambridge: Cambridge University Press. ↑ 42,0 42,1 Sutton-Spence, Rachel, and Bencie Woll (1998). The linguistics of British Sign Language. Cambridge: Cambridge University Press. ↑ Klima, Edward; Bellugi, Ursula. "The Signs of Language." Sign Language Studies, vol. 1062, no. 1, 1989, pp. 11. ↑ Brentari, Diane. "Introduction." 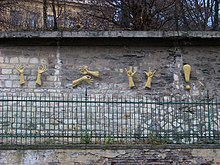 Sign Languages, 2011, pp. 12. Canlas, Loida (2006). "Laurent Clerc: Apostle to the Deaf People of the New World." The Laurent Clerc National Deaf Education Center, Gallaudet University. Archived September 3, 2006, at the Wayback Machine. Emmorey, Karen; & Lane, Harlan L. (Eds.). (2000). The signs of language revisited: An anthology to honor Ursula Bellugi and Edward Klima. Mahwah, NJ: Lawrence Erlbaum Associates. 0-8058-3246-7. Gordon, Raymond, ed. (2008). Ethnologue: Languages of the World, 15th edition. SIL International, 978-1-55671-159-6. Archived January 13, 2013, at the Wayback Machine. Sections for primary sign languages  and alternative ones . Groce, Nora E. (1988). Everyone here spoke sign language: Hereditary deafness on Martha's Vineyard. Cambridge, Massachusetts: Harvard University Press. 0-674-27041-X. Johnston, Trevor A. (1989). Auslan: The Sign Language of the Australian Deaf community. The University of Sydney: unpublished Ph.D. dissertation. 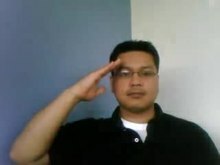 Archived July 26, 2008, at the Wayback Machine. Klima, Edward S. & Bellugi, Ursula. (1979). The signs of language. Cambridge, Massachusetts: Harvard University Press. 0-674-80795-2. Krzywkowska, Grazyna (2006). "Przede wszystkim komunikacja", an article about a dictionary of Hungarian sign language on the internet (Լեհերեն). Lane, Harlan L. (Ed.). (1984). The Deaf experience: Classics in language and education. Cambridge, Massachusetts: Harvard University Press. 0-674-19460-8. Lane, Harlan L. (1984). When the mind hears: A history of the deaf. New York: Random House. 0-394-50878-5. Madell, Samantha (1998). Warlpiri Sign Language and Auslan – A Comparison. M.A. Thesis, Macquarie University, Sydney, Australia. Archived June 8, 2011, at the Wayback Machine. Madsen, Willard J. (1982), Intermediate Conversational Sign Language. Gallaudet University Press. 978-0-913580-79-0. Padden, Carol; & Humphries, Tom. (1988). Deaf in America: Voices from a culture. Cambridge, Massachusetts: Harvard University Press. 0-674-19423-3. Sacks, Oliver W. (1989). Seeing voices: A journey into the world of the deaf. Berkeley: University of California Press. 0-520-06083-0. Sandler, Wendy & Lillo-Martin, Diane (2001). "Natural sign languages". In M. Aronoff & J. Rees-Miller (Eds. ), Handbook of linguistics (pp. 533–562). Malden, MA: Blackwell Publishers. 0-631-20497-0. Stiles-Davis, Joan; Kritchevsky, Mark; & Bellugi, Ursula (Eds.). (1988). Spatial cognition: Brain bases and development. Hillsdale, NJ: L. Erlbaum Associates. 0-8058-0046-8; 0-8058-0078-6.